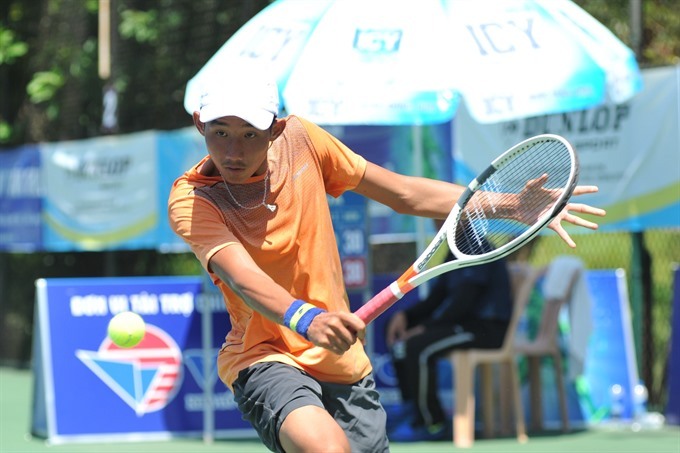 HÀ NỘI — Trịnh Linh Giang defeated Nguyễn Đắc Tiến in the first round all-Vietnamese match at the Vietnam F3 Futures tennis tournament yesterday in Huế. Giang won the singles match 6-4, 6-1 within 80 minutes and set up a rendezvous with No 2 seed Karunuday Singh of India in the second round. Singh overcame his countryman Nitin Kumar Sinha 6-3, 6-2 in another match yesterday. In another match, Vietnamese player Trần Quang Trường lost 1-6, 1-6 to No 8 Song Min-kyung of South Korea. Takashi Saito of Japan beat Australian Matthew Romios 7-6 (2), 6-1; No 4 Alexios Halebia from the US won 6-3, 6-7 (3), 7-5 over Adrian Andrzejczuk of Poland. No 1 seed Lý Hoàng Nam of Việt Nam will play today against Son Ji-hoon of South Korea. His partner in the F1 Futures’ doubles win Phạm Văn Phương will face Japan’s Gengo Kikuchi. According to latest world ranking release, Nam has jumped to No 433—his highest position ever and the highest spot ever held by a Vietnamese player. Phương is No 1,430, a leap of 153 spots.